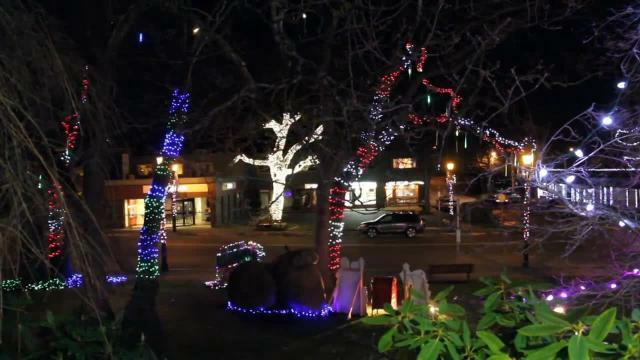 Oak Bay village kicks off Christmas with family fun Nov. 26. Crafts, family activities, street games and and live music set the stage for the holiday Sunday afternoon starting at 2 p.m.
For the 17th annual light up, craft stations, games and activities fill Oak Bay Avenue alongside a variety of street food including the longstanding tradition of roasted chestnuts outside Ottavio Italian Bakery. Paul Kilshaw, in another lengthy tradition, will add magic and balloon twisting to the affair while Theatre SKAM returns sharing much-loved Christmas stories in their Pop Up Theatre. Live music this year features tunes written and sung by Canadian performers – Peter Dowse, Danuel Tate, Michael Wilford, Oliver Swain and Daniel Lapp – in celebration of Canada 150. Victoria’s newest country folk quartet, The Getaway Band will also perform and the Joy of Life Choir leads the crowd in singing favourite Christmas songs. Longtime master of ceremonies Bill Murphy-Dyson leads his high energy rendition of The Twelve Days of Christmas ahead of the big light up countdown. Once the lights go on, Santa Claus arrives on an Oak Bay fire truck. He plans to hang around for photos with donations toward the fire department’s’ purchase of nonessential equipment.